Whether your kids are studying, hanging out with friends, or lounging around, this your zone flip chair is the perfect addition to any room. 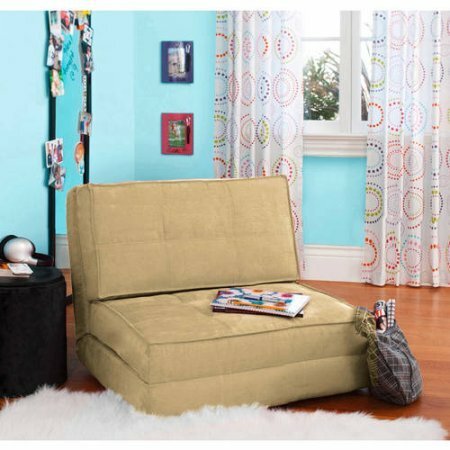 Totally adjustable, this chair unfolds to a bed and fits in with other pieces from the your zone collection. your zone - flip chair, Khaki: Chair size: 29.2" x 29.5" x 23.9". Bed size: 79.53" x 29.5" x 5.1". Product Details: Chair size: 29.2" x 29.5" x 23.9". Bed size: 79.53" x 29.5" x 5.1". Easy to use. Ultra-suede material. Convertible chair/bed requires. No assembly. Chair size: 29.2" x 29.5" x 23.9"
Bed size: 79.53" x 29.5" x 5.1"